Like its native country, the discipline of political science in Belarus will take decades to outgrow its Soviet past. After all, most of the country’s contemporary social science luminaries were brought up on the volumes of scientific communism, memorizing the blessings of the socialist revolution and the proletarian dictatorship, and today force-feed their own students with courses like the “Ideology of the Belarusian State.” As a result, the spectre of communist past still haunts the Belarusian academia. Overcoming that “spectre” is what inspired five young researchers at the Belarusian State University to found Palitychnaja Sfera (Political Sphere), the only professional journal of political studies in Belarus. Since its inception in 2001, the journal has evolved into a dynamic and professional research institute geared toward acquiring new knowledge and presenting it at the academic and political levels, as well as to the public at large. Today, Political Sphere is, first and foremost, a community of political and social scientists. “Our main focus is the gradual formation of a Belarusian school of political studies,” explained Andrei Kazakevich, director of the Institute, in a Feb. 15 interview. Political Sphere aims to represent achievements of Belarusian political science without political and ideological limitations, overcome negative consequences of authoritarian rule for the Belarusian academic community and society, and maintain a dialogue between political scientists, the public, and the private institutions. Political Sphere also hopes to encourage the study of Belarusian politics, stimulate research and analytical activities in Belarus, and integrate Belarusian scientists in the international academic community, according to the “Concept note” on the Institute’s web site. This spring, Political Sphere is completing a research project on the evolution of Belarusan national identity in 1990-2008. Nation, national project, concept of nation, and ethnic conflicts are the focus for the upcoming issue of the journal. “The topic is very important for Belarus, which is undergoing the process of nation-building, and where the national identity is fragmented,” said Kazakevich. The journal Political Sphere receives submissions from the researchers in Ukraine, Russia, Lithuania, and the United States, but most of its contents comes from Belarusan authors, according to Kazakevich. All articles pass an anonymous review. Sometimes the institute publishes the so-called “English issues,” compiled from the most interesting articles translated into English, said the Institute’s researcher and board member Siarhei Kuzniatsou in a Feb. 16 e-mail. The publication’s primary audience is political scientists, students, analysts, and observers. While Political Sphere may also be of interest for politicians and government officials, “they feel themselves smart enough without such readings,” noted Dzianis Melyantsou, a researcher and board member of the Institute, in a Feb. 15 e-mail. 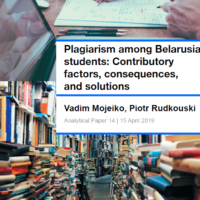 Having experienced the “idiosyncrasies” of Belarusan academia firsthand, members of the Institute identify the absence of empirical research and the isolation from international academia as the main obstacles to the growth of political science in Belarus. These obstacles have been both the main reason for the journal’s existence and the primary concern of the founders of Political Sphere, who in 2005 moved the journal to the European Humanities University in exile in Vilnius, Lithuania, due to the increasing suppression at home. According to Kazakevich, the move is partial, and Minsk remains the center for the scientific community associated with the journal. In 2009, Political Sphere became indepenent from EHU, but remains registered in Lithuania. The Political Sphere team consists of 12-15 permanent authors and researchers, all of whom are political scientists and sociologists between the ages of 25 and 35. Some of them are associated with Belarusan State University and National Academy of Sciences, while others received their MA and PhD degrees abroad, according to Melyantsou. Andrei Yahorau, a researcher and a board member at the Institute, said in a Feb. 16 e-mail the team’s age corresponds to the age of the Belarusan political science, which started developing only in the recent 15-20 years. According to Yahorau, the team’s interest in political science emerged as a result of the necessity to understand the political contradictions of the 90s. With contemporary Belarus being a “barely known state from the scientific view point,” we are excited about discovering and describing every piece of Belarus’ political reality,” he said. The difficult conditions of Belarus’ social sciences have affected the career trajectories of all members of Institute. “It is very difficult (and often impossible) to defend a dissertation, get a job at the university that will correspond to one’s qualification and career plans, undertake independent research, or officially publish one’s work,” said Yahorau. “For the authoritarian regime in Belarus, research on politics is a taboo,” Kazakevich said. “Political science is squeezed out by ideology, and ‘politics’ is considered as an undesirable and risky research subject. Belarus’ conservative and patronizing academic community is isolated from its western equivalents, and there is no dynamic or incentives for creative work.” Kazakevich said the discipline of political science has never become quite legitimate in Belarus. “Its main difference with the West is the orientation on translating current knowledge and speculative musings. Empirical research and attention to details is lacking,” he added. The article originally appeared in Spring 2010 Belarusian Review (Vol. 22, No. 1). In September 2009, the President of Poland Kaczyński sent his condolences to the President of Belarus because of the death of two Belarusian pilots in a crash of Su-27 fighter plane at an air show. Today, state leaders around the world are condoling with the Poles at the loss of President Lech Kaczyński and 95 others in a plane crash near Smolensk. On April 10, Lech Kaczyński was flying to commemorate the deaths of thousands of Poles murderedby the Soviet Union and buried in the Katyn Forest just across the eastern border of Belarus. On March 5, 1940, Joseph Stalin signed an order to execute 25,700 Polish prisoners of war in the camps of Ostashkov, Starobelsk, and Kozelsk. Only in 1990 did the Soviet authorities admit responsibility for the Katyn murders. Because of the fog, it was difficult for the pilots to land in Smolensk airport, near the Katyn Forest. Polish media report that air traffic controllers had advised the Polish pilots not to attempt to land at the airport, but turn around and head for Minsk, the capital of Belarus. The obscure military aerodrome near Smolensk lacked the necessary navigational equipment to receive planes in heavy fog. Despite these warnings, Polish pilots, apparently under pressure from their VIP passengers, decided to take the risk of landing in Smolensk. Perhaps, the Polish delegation had its own reasons not to land in Belarus. Few people outside Warsaw and Minsk know that Lech Kaczyński was one of the staunchest defenders of human rights in Belarus and a vocal critic of its president. Just last month, condemning the detentions and trials of activists of the Union of Poles in Belarus, Lech Kaczyński wrote a personal letter to Alyaksandr Lukashenka defending the Polish minority. Having received no response from the Belarusian authorities, Lech Kaczynski appealed to the European Union’s institutions though the President of the European Union Herman Van Rompuy and European Parliament President Jerzy Buzek. Notably, Belarus did not send a delegation to the earlier ceremony in Katyn. This is despite the fact that Katyn’s victims included hundreds of Belarusians who served in the Polish Army in 1940 when Western Belarus was a part of Poland. 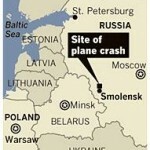 If the Belarus president were to fly to Smolensk, he would not have used an old Soviet plane for that. Ever mindful of what losing their leader would mean for the Belarusian people, President Alyaksandr Lukashenka has long ago switched to the sleek and safe US Boeing. Lech Kaczyński was flying a 20-year old Tupolev Tu-154. Tupolev’s long history of crashes has never been a secret, but the Polish leadership considered buying a new US-manufactured Boeings an unnecessary indulgence during the financial crisis. Seventy years after the massacre orchestrated by Stalin, the Polish people once again lost some of its best compatriots in the cold foggy forest near Katyn.